Masimo's acoustic respiration sensor the RAS-45 for Rainbow Acoustic Monitoring scored FDA clearence for infants and neotal patients 10kg and under. 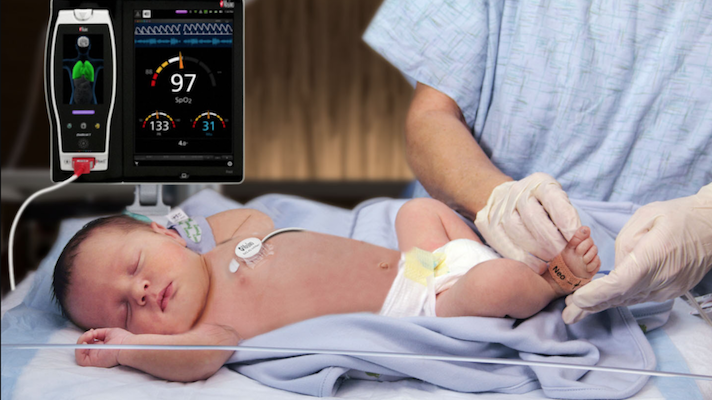 Furthering its move into the neonatal space, this morning non-invasive patient monitoring device and sensor maker Masimo announced that it landed FDA clearance for its acoustic respiration sensor, the RAS-45, to be used with infants and neonatal patients as part of its Rainbow Acoustic Monitoring (RAM) system. Previously, the company's RAS-45 and RAS-125 sensors were cleared for adults and children over 10 kilograms, approximately 22 pounds. The RAS-45 is an adhesive sensor that can be applied to a baby’s chest and, when used within the RAM system, can non-invasively and continuously measure a patients respiration rate. On larger patients, over 10 kilograms, the sensor is placed on the patients' neck. The system is designed to work with other Masimo products, including the Masimo Extraction Technology. When the systems work together the RAS-45 can use the acoustic signal process to separate and display continuous respiration rate and acoustic respiration waveform. The company said this technology is beneficial for infants and neonatal patients because it will allow a more accurate respiration rate range, which can be expanded up to 120 breaths per minutes. The RAS-45 is smaller than its predecessor the RAS-125, weighing only 13 grams. Masimo has a long history in the digital health space. In 2016 the Irvine, California-based company got the FDA nod for its noninvasive patient monitoring device with forehead sensors. The sensor measures patients pulse oximetry at an alternative site from the finger. In 2017 the company expanded the capabilities on its connected platform Root to let doctors see data more clearly, and in the configuration that works best for them. But Masimo isn’t the only digital health company that has turned its attention on the infant space. In fact, at CES2018 there was an entire section devoted to baby’s products. These products ranged from remote temperature monitoring systems to heart beat monitoring technology.